US News & World Report published their high school rankings for 2016. 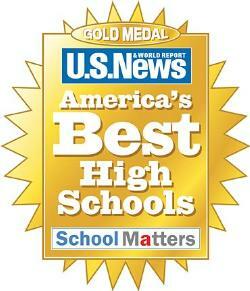 Once again, DBHS was ranked among the best schools in the state and the nation, receiving gold medal status out of 30,000 US high schools. Our rankings are a result of a partnership among students, staff, parents, community members, and the district office in supporting the balance provided by our foundations of the four A’s: Academics, Activities, the Arts, and Athletics. At the center of our foundations is our belief in providing equitable access to opportunities for success to ALL of our students. US News & World Report rankings intend to reflect great high schools that serve all of their students well, not just those who are college bound. These high schools must be able to produce measurable academic outcomes to show how they are successfully educating their student body across a range of performance indicators. • Whether the school’s students were performing better than their state counterparts. • Whether African-American, Latino, and low-income students at the school were outperforming their state counterparts. Which schools produced the best college-level achievement for THE HIGHEST percentages of their students.